The young Kalamazoo Peregrines continue their training in downtown. As they are roaming more, they are more difficult to see predictably especially midday. They are more reliable between 6:30 and 8, either AM or PM, but neither Dave C nor I have been able to confirm all four juveniles at one time in a while, so I was getting a bit worried. However, kudos to Andrea Z who spotted all four youngsters and an adult Friday evening (7/1). Andrea noted that Arcadia had scored some food and her siblings were intent on getting it from her. It appears all is well with our birds and we will hope for continued success for our 2016 young crew. 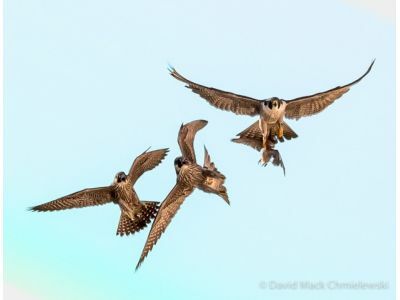 Other areas of Michigan report sad news about some of their Peregrines. Grace, the single chick at the Mt. Clemons County Building flew into a window and died from her injuries. A male chick that fledged on June 10 from the Fisher Building in Detroit has been captured with a broken leg and will go to rehab for about a month. And, very sadly, Viper, the 4-year old female Peregrine in Lansing was found dead and appears to have been hit by a car. She had four youngsters, about the same age as ours in Kalamazoo. Perhaps she was training them to hunt by dropping prey and then diving down to retrieve it and got too close to the street. Her mate, Eckert, appears to be taking care of the chicks but he certainly has his work cut out for him as a single parent of four teenagers. We received a recent update on Promise, our 2014 model who is now a Dad in Detroit. He and his family are doing well and the update and nice photo were shared on the Audubon Society of Kalamazoo Facebook page.